Today at the SharePoint Virtual Summit, streamed live from SharePoint Conference North America, we shared our vision and roadmap for 2018—showcasing innovations that bring Microsoft’s investments in AI and mixed reality to life and new experiences and features to transform content collaboration for the modern workplace. With over 400,000 customer organizations, SharePoint leads the industry in content services and collaboration. SharePoint pioneered combining document management and web publishing, bringing enterprise content management to the cloud and infusing AI into content collaboration with the Microsoft Graph. Today, we take our next, innovative step forward with SharePoint spaces. Mixed reality is one of the most important technological trends in the modern workplace, with the power to transform work for everyone, from the executive suite to the front line. Earlier this month, we announced two powerful mixed reality applications: Microsoft Remote Assist and Microsoft Layout. Today, we unveiled SharePoint spaces—immersive, mixed reality experiences—which enable you to view and interact with content from every angle and visualize and manipulate data and product models in real-time. SharePoint mainstreams mixed reality, empowering everyone to create visually compelling spaces that are available to anyone, on any device. Recruiting and onboarding​—Recruits or new employees can learn about a company in a compelling, 360-degee virtual welcome and orientation, including a 360-degree video message from leadership. They can navigate the campus or building with 3D maps, learn the organizational structure with an interactive organization chart, or explore rich information about coworkers and the organization’s products. 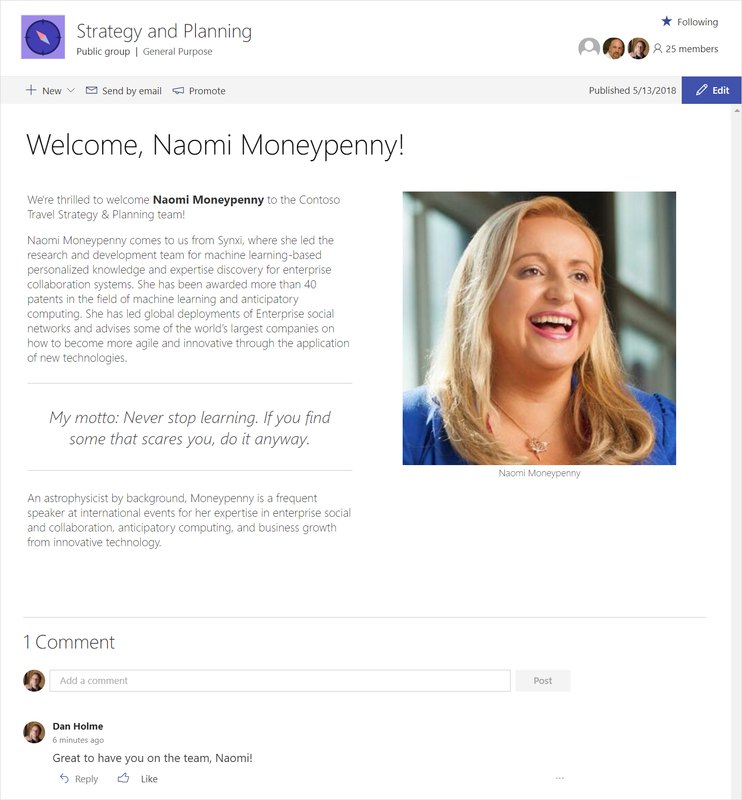 SharePoint powers content collaboration in Office 365, and we have infused SharePoint with AI. So, when you store your files, images, and data in Office 365, AI unlocks valuable content and enables new scenarios. AI builds an understanding of what you work on, how you work, and how your colleagues’ work relates to you. AI uses this intelligence to process the ever-growing quantities of information, helping to prioritize what matters to you in personalized, time-saving experiences. Personalized, intelligent search in the SharePoint mobile app—When you need expertise, content, apps, or resources when you’re on the go, the new Find tab in the SharePoint mobile app is a great place to start looking. 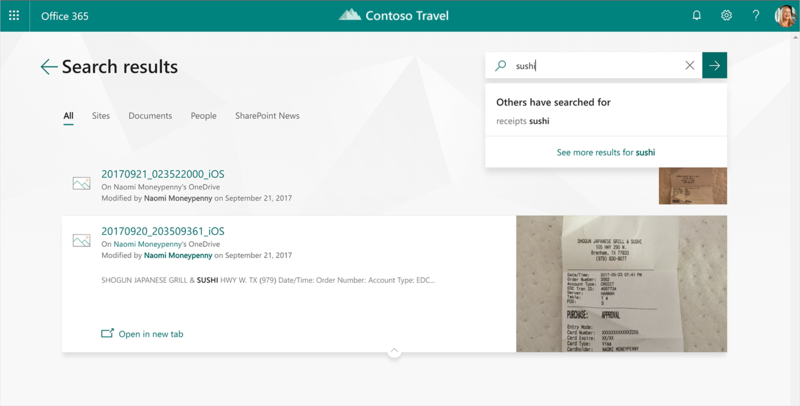 The Find tab, coming to the SharePoint mobile app, lets you find people, content, and answers to your questions while on the go. You’ll see links to documents and sites you were recently working on, across your devices. You’ll see recommendations of sites, files, news, and people that have been identified as relevant to you. You might find what you need without having to search at all. And when you perform a search, the results are refined as you type, returning personalized results based on your role, your work, and the people you work with. Search history and queries curated by your organization make it easy to find things. And instant answers to your questions showcase the power of AI, transforming search into action. 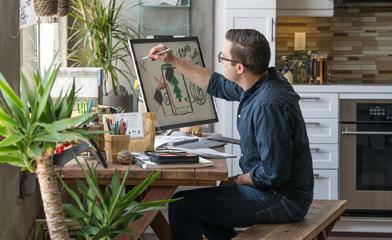 New, personalized Office.com—Office.com saves you time, so you can start work and get back to what matters most to you. In the Recommended section, you’ll see files that AI has identified as most likely to need your attention. In the Discover section, you can see the files your colleagues are working on and files available to you that you may not even know existed. 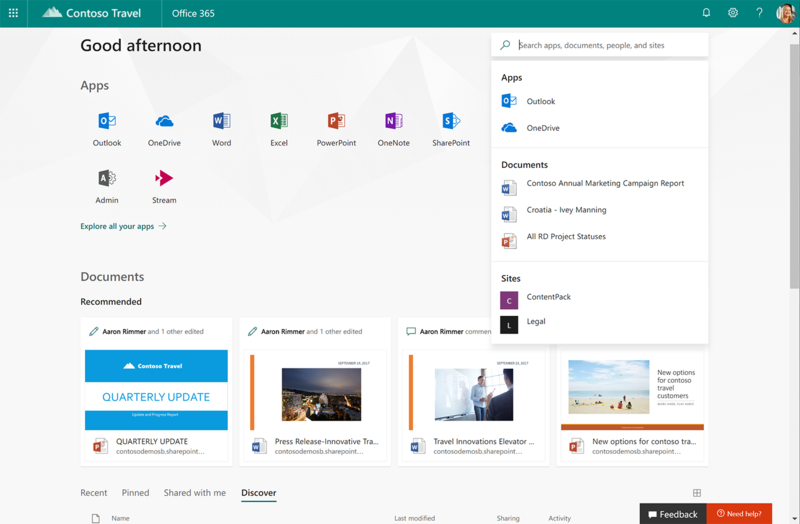 The new Office.com helps you get to work on what matters most, with a list of Recommended files powered by AI. AI also unlocks the value of complex content, such as images and videos, providing new opportunities to automate image- and video-based processes. We’ve also made it easier than ever to capture photos, documents, whiteboards, and business cards with the new Scan button in the OneDrive mobile app. As a business user, you can configure OneDrive to upload photos automatically to Office 365. Cognitive services for business process automation—Today, we also demonstrated using Microsoft Flow to streamline processes that integrate cognitive services, including geolocation, image recognition, text extraction, machine translation, and sentiment analysis. Now, anyone can harness the power of AI to transform business processes. At the SharePoint Virtual Summit, we also shared innovations that make it easier for you to share and work together, inform and engage people across the organization, support compliance, and create a seamless journey for users, from on-premises to the cloud. New files experience in Microsoft Teams—We are bringing the full power of the SharePoint document library experience to Microsoft Teams. On any Files tab, you’ll able to create custom views, pin documents to the top, add and format custom columns, and gain insights into file activities. The new experience features the document library command bar, which, among other things, lets you launch flows and sync files to your Mac or PC. Organizational news and page management—Open, transparent communication is critical to employee engagement. SharePoint pages and news are a powerful tool for internal communications, distributing news and announcements to targeted audiences across the organization, on any device. SharePoint pages let you communicate news and information with rich web parts that integrate content from across Office 365 and outside sources. Today, we announced that SharePoint will power organization-wide news communications, with new page management capabilities such as scheduling, approval, page metadata, and audience targeting. SharePoint news uses pages and web parts with rich, dynamic content to keep people up-to-date. GDPR and multi-geo data residency for SharePoint—Office 365 empowers you to support sophisticated requirements for security and compliance, including tools that will help you stay compliant with the General Data Protection Regulation (GDPR), which goes into effect May 25, 2018. Today, we announced that Multi-Geo Capabilities for Office 365 will be extended to SharePoint, beginning with a public preview this summer. On-premises, hybrid, and migration announcements featuring SharePoint Server 2019—Organizations of all sizes, from all industries and all corners of the world, are rapidly adopting Office 365, where they can leverage the integration, scale, and intelligence of the cloud to provide maximum value to their employees, IT admins, and developers. We remain committed to supporting customers who maintain SharePoint and OneDrive workloads on-premises, and today we announced that SharePoint Server 2019 will enter public preview in June. SharePoint Server 2019 supports powerful, integrated hybrid scenarios out-of-the-box, and delivers user interface improvements, including modern team sites, communication sites, lists, libraries, pages, and news. By bringing the modern user experience and extensibility support with the SharePoint Framework to SharePoint Server, customers can facilitate user adoption of the cloud, and eliminate sharp differences between sites on-premises and in Office 365. And to facilitate your journey to the cloud, we announced that customers can automate migration using PowerShell support for the SharePoint Migration Tool. SharePoint powers content collaboration for the modern workplace, giving you anywhere access to all your files with OneDrive, real-time document collaboration with Office applications, teamwork with Outlook and Teams, intelligent intranets with Yammer and Stream, and streamlined business processes with PowerApps and Flow.